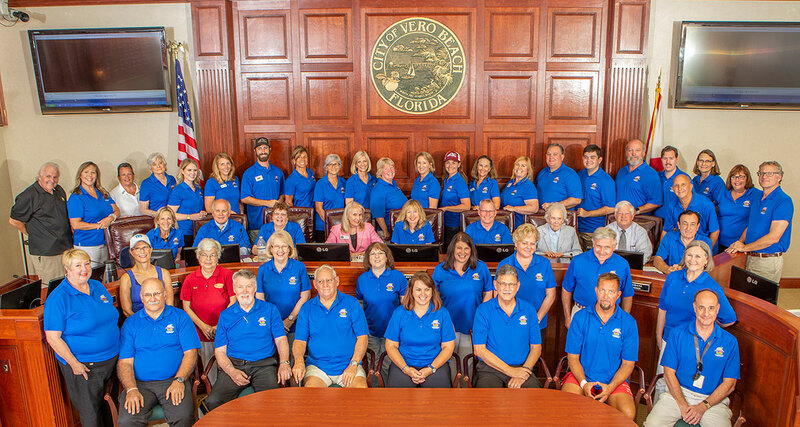 The Vero Beach Centennial Committee has attracted dozens of volunteers, including these attending a July 17 City Council meeting at which the council declared October 2018 through October 2019 a year of centennial celebration. First row, from left: Jim Wilson, John Michael Matthews, Lee Orre, Michelle Wagner, Todd Scher, Eric Toomsoo, Patrick Jordan; second row: Joan Edwards, Cathie Callery, Ruth Stanbridge, Pam Cooper, Lisa Doidge, Angie Scheppers, Laura Lewis, Stu Keiller, Brenda Corum; third row: Amy Brunjes, Bart Gaetjens, Marilyn Dussault, Laura Moss, Tammy Bursick, Tony Young, Alma Lee Loy, Jim O’Connor, Bob McCabe; fourth row: Paul Bartoszewick, Kim Brady, Kathy Bartoszewick, Barbara Hoffman, Kristina Pantelides, Jessica Schmidt, Alan Dritenbas, Catherine Caddell, Linda Hillman, Elaine Jones, Mary Silva, Peggy Lyon, Amanda Martin, Kelly Ward, Heather Stapleton, Casey Lunceford, Lance Lunceford, Ray Adams, Tyler Kennison, Marty Paris, Etta Schaller, Bev Paris and Rob Slezak. It began as a casual conversation nearly 16 months ago between City Clerk Tammy Burick and Councilman Tony Young. The two had worked together on Vero Beach’s 75th and 90th anniversary celebrations and thought the city’s centennial celebration should be bigger and better. So they met with Rob Slezak of the recreation department and came up with a list of ideas. Young presented their plans, which the city council approved, and they were off and running. A committee of dedicated residents, business owners and politicians came together to prepare a year of varied activities for this once in a lifetime opportunity to share the city’s history, accomplishments and people. Young, a Vero Beach native, is a councilman with long family ties to the community. His grandfather, A.W. Young, was Vero’s first mayor who was elected in 1919 and served an additional term in 1935. Tony had a long and distinguished career in the Army that allowed him to travel the world, but when it came time to retire he chose to come home to Vero Beach. Young worked with the Veterans Council of Indian River County and was instrumental in spearheading the redevelopment of the city’s Memorial Island Sanctuary. Beverly Paris, co-owner of Paris Productions and Vero resident for more than 35 years, has taken on the monumental task of updating the ever-changing calendar. Paris is very familiar with Vero Beach history having served on the 90th anniversary committee and as one of the founders of Downtown Friday and the Hibiscus Festival for Mainstreet Vero Beach. The excitement is sure to mount as the events unfold. While it’s taken more than a year to plan the festivities, it’s taken literally a century to plan such a beautiful city. Vero Beach has become an enviable model of forward vision and careful planning by our forefathers. It’s unique blend of oceanside serenity, lush tropical landscape, exquisite architecture, and controlled growth has created this jewel on the Treasure Coast. So, whether you call Vero Beach home, you’ll find something for everyone during the 100th birthday celebration.